The Harrier had been designed from the beginning to attract export sales. The first of these was the US Marine Corps who began to take an interest around 1969 when the jet was first introduced into the RAF service. 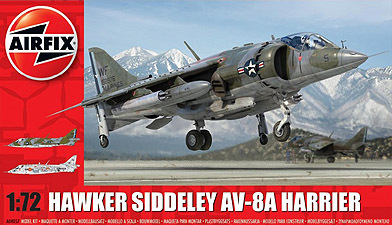 Hawker Siddeley made some modifications to the aircraft and in 1971 the AV-8A Harrier entered service with the USMC as a close support aircraft. Operating from amphibious assault ships the Harrier's role was to augment that of the larger US Navy warplanes by providing troops on the battle field with close air support at a moments notice in a similar way to that provided by helicopters but with heavier weapons. Later, starting in 1979, the AV-8As were upgraded to AV-8C specification. by this time their effectiveness had been proven in many practice exercises and their superb manoeuvrability demonstrated in mock dog-fights with F4 Phantom fighters. Today the Marine Corps continues to operate the AV-8B Harrier II.